Ozark Homogeniser Mixers have solved a wide range of mixing problems within the textile, food, pharmacuetical, paint, ink, adhesives and coating industries, wherever emulsification, homogenisation or dispersion has been difficult. Uniform dispersion, faster homogenisation and quicker particle breakdown not only save valuable production time but also lead to higher throughput and a superior end product with a smoother mix. The action of the Ozark mixer is that of a true reversing homogeniser, giving better incorporation of powders due to its reversing capability, with the greater mixing action leading to better mixing at high viscosities. This is a very important consideration in textile printing, where high viscosity print thickeners and highly viscous pigment print binder systems are used extensively. The superior mixing ability of the Ozark Homogeniser Mixer has a further advantage, namely, that stratification is avoided. This is a problem particularly in high viscosity mixes where the bottom layer of material in contact with the surface of the mixing vessel may not be circulated, leaving a stationary layer. This can lead to streaking and to wastage of costly materials on every batch mixed. This clearly contributes to greater environmental pollution and extends the time required for cleaning down between batches. Constructed in Type 316 stainless steel throughout, the mixer can be run in forward mode creating recirculation of the material within the mixing vessel by forcing the material in an upward direction against the baffle plate, then downwards. Shearing of the material takes place within the 'shearing gap' between the propeller blade and the stator. Where optimum dispersion of powders is required, the mixer can be run in reverse mode, in which the powder is first drawn down in a vortex through the turbine and then directed against the bottom of the mixing vessel. This action is quick and effective because of the design of the stator head, and prevents the formation of fish-eyes and agglomerates. In addition, the efficiency of the mixer unit can eliminate the need for additional mechanical devices which have traditionally been used for powder incorporation. 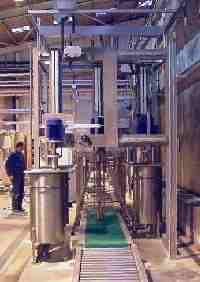 Mixing units are also available to suit sanitary applications.